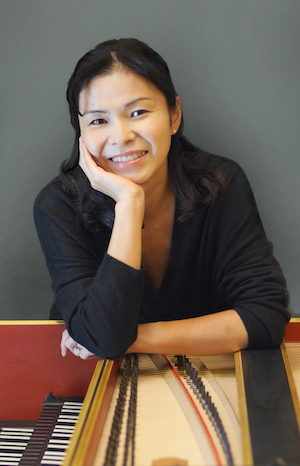 Harpsichordist Takae Ohnishi graduated from Toho Gakuen School of Music in Tokyo, and has performed extensively in major cities in Japan and in the U.S. as a soloist, chamber musician and continuo player. As a lecturer, she participated in a lecture series entitled "Historical Performance Practice," recorded and published by Tokyo's Muramatsu Gakki company. She is a prizewinner at the International Early Music Harpsichord Competition in Japan. Her first solo CD "A Harpsichord Recital" was selected as an International Special Prized CD in the Japanese music magazine Record Geijyutsu in 2002. In the summer of 2004, she was featured as a soloist at the prestigious Ishihara Hall 10th Anniversary Concert series. She has also been invited to perform at the Fukuoka Early Music Festival as well as Japan Early Music Performers series. Her recent recital tour in Japan in 2006 has been broadcast nationally on NHK TV. Ms. Ohnishi is an interpreter of both Baroque and contemporary music. As a specialist in Baroque music, she recently performed the Brandenburg Concerto and Bach's harpsichord Concerto as a soloist with both the Atlantic Symphony Orchestra conducted by Jin Kim and the Boston University Baroque Orchestra conducted by Martin Pearlman. She has also appeared as a soloist at various recitals and concert series presented by the MIT Chapel, King's Chapel, Swedenborg Chapel and the Boston Early Music Festival. She has been a continuo player with Pro Arte Chamber Orchestra, Atlantic Symphony Orchestra and the Gardner Chamber Orchestra. In 2007, she performed solo recital "All D. Scarlatti Program" at the Boston Early Music Festival and the complete Brandenburg Concertos at the Gardner Museum directed by Paula Robinson. As an interpreter of new music, Ms. Ohnishi appeared as a guest artist at the Summer Institute for Contemporary Piano Performance held at the New England Conservatory of Music. She also performed contemporary music with the Harvard Group for New Music and the Callithumpian Consort. Ms. Ohnishi holds a Master of Music degree from the New England Conservatory of Music and is completing a Doctor of Musical Arts degree at Stony Brook University. Her teachers include Arthur Haas, Peter Sykes, John Gibbons and Chiyoko Arita.